We would like to remind Garry that one of his major achievements in his early career is connected to Georgia. It was exactly in Tbilisi where Garry won the USSR champion's title in 1976. A long time has passed since then, but for Georgia and Georgian chess players Garry always stayed an outstanding champion, moreover, our grandmasters Zurab Azmaiparashvili and Gia Giorgadze were members of his coaching team for many years. In Georgia we always respected Kasparov's innovative projects. We hope that once the election fever is gone, Garry will reconsider his attitude towards our country where he has a lot of fans and friends. Holding the Olympiad is the most significant project for our country which will complete the cycle of the state program of chess development (2014-2018). Georgia has always been and will always be the state with rich chess tradtitions and perspectives. . Whom Are You Supporting, Colleagues? After reading the letter signed by the esteemed colleagues-champions, I also can't hide my disappointment and frustration. How come two outstanding chess players are puppets of other forces? As the readers probably know, a number of large-scale chess events will take place in Georgia in the near future: a stage of the FIDE Grand Prix in February, World Youth Championships (8-12 y.o.) 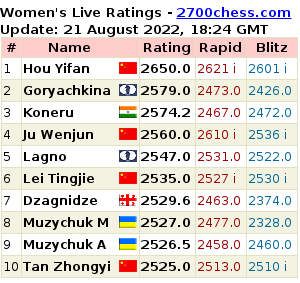 and a stage of the women's FIDE Grand Prix in 2016, FIDE World Cup in 2017, European Individual Championships and the Chess Olympiad in 2018. Karjakin Supports Ilyumzhinov: "Kasparov Hasn't Showed Himself As a Good Organizer"
"I will support Kirsan Ilyumzhinov because he did a lot for the development and popularization of chess," Itar-Tass quotes Sergey Karjakin. 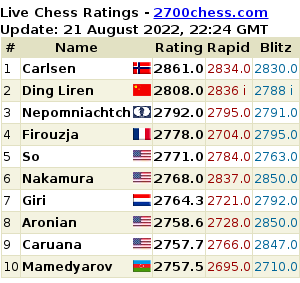 "A lot of strong competitions have been introduced thanks to him, World Cup, FIDE Grand Prix, World Rapid and Blitz championships among those."